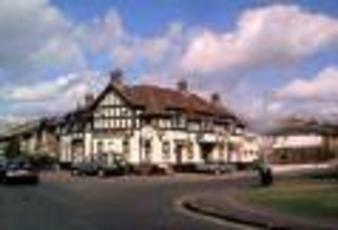 It recently reverted to its original name, The Six Bells, before closing for a while. It has now re-opened as Le Papillon, a French bar and restaurant and is now longer a pub. The decor is swish, the menu fish-centred and the pool table etc are gone. C'est la vie et vive la difference! Nobody's commented on this pub very much. Hardly surprising as nobody goes in this pub very much. Indeed many have wondered how it still keeps going, as it is invariably empty when it bothers to trade at all; other times it remains closed and dark when other pubs are open. Now that the Bull and Bush on the Cambridge Road estate has closed down, possibly this pub and the Bricklayers will get an influx of people from the estate, but without this I can't see how it can survive on a handful of customers, appallingly bad beer (do they not realise it's off; badly off?) - which is a shame as it is a nice building and they have been known to have live music including jazz. A little band called Sunday's Child played there regularly in recent years, and recent refurbs have done away with the odd purple paint and given the place a small outside area to the side. Years ago it had much more character but it has unfortunately been refurbed in between times, to strip out much of what was there. Curiously the incumbents then were the mum and dad of the guvnor of one of the nearby pubs at the moment. Great pub, fantastic food and the landlord is tasty too! Dodgy cheap food pulls in punters but not my kind of place at all. Beer is not a strong point.